Join the effort to promote social and behavioral science research by becoming a member of COSSA today! COSSA’s biweekly policy newsletter, the COSSA Washington Update. Timely, members-only updates on policy developments or other unique opportunities for social and behavioral science researchers. Action alerts when your organization’s grassroots participation is needed. Early access to COSSA’s in-depth analysis of the President’s annual budget request and appropriations legislation. Discounted registration rates for the annual COSSA Science Policy Conference and Social Science Advocacy Day. 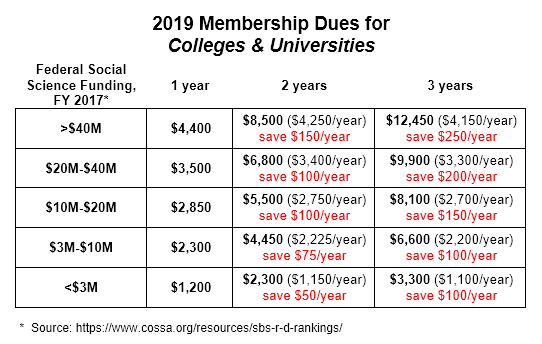 Click here to learn more about the benefits of COSSA membership. In addition, your organization/institution will be part of a broad community advocating for shared goals and enjoy access to COSSA expertise for timely policy information. COSSA membership is institutional and includes two main categories: Governing Members and Non-Governing or Affiliate Members. They represent a relatively large number of the professional scholars in their discipline or field as measured by membership, meeting size, or similar indicators. Governing Member associations each have one (1) seat on the COSSA Board of Directors and are involved in the overall governance of the organization. New Governing Members are voted into the association by a vote of the Board of Directors. A fair-share dues model is used to set annual Governing Member dues. Contact the COSSA Executive Director to inquire about membership at the Governing Member level. Non-Governing categories of COSSA membership include: Membership Organizations, Research Centers & Institutes, and Colleges & Universities. The list of current Non-Governing Members can be found here. 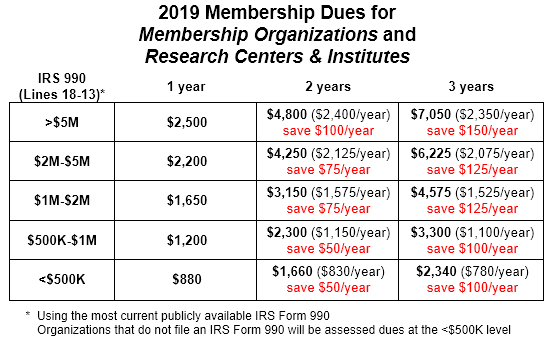 Dues for Membership Organizations and Centers & Institutes are set according to the amount of expenses reported on an organization’s IRS form 990 (subtracting line 13 from line 18). The 2017 dues schedule for member organizations is shown below. Contact the COSSA Executive Director to inquire about Non-Governing membership.